Info "Toki Tori can't fly! Help him!" Toki Drop is a downloadable microgame in WarioWare: D.I.Y. and WarioWare: D.I.Y. Showcase. It was made by Collin van Ginkel and is distributed as a Big Name Game. It was released on December 2, 2010 in Europe. Toki Drop is based off the Toki Tori series developed by Two Tribes B.V. and features Toki Tori, a yellow chick and the main character of the series. Toki Tori stands on top of a floating balloon. Below Toki Tori is a moving target. 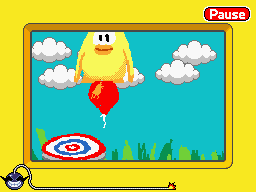 The player must pop the balloon using the stylus and safely land Toki Tori onto the target in order to win. If the target is missed and Toki Tori falls off the screen, the game is lost. This page was last edited on April 17, 2019, at 17:12.